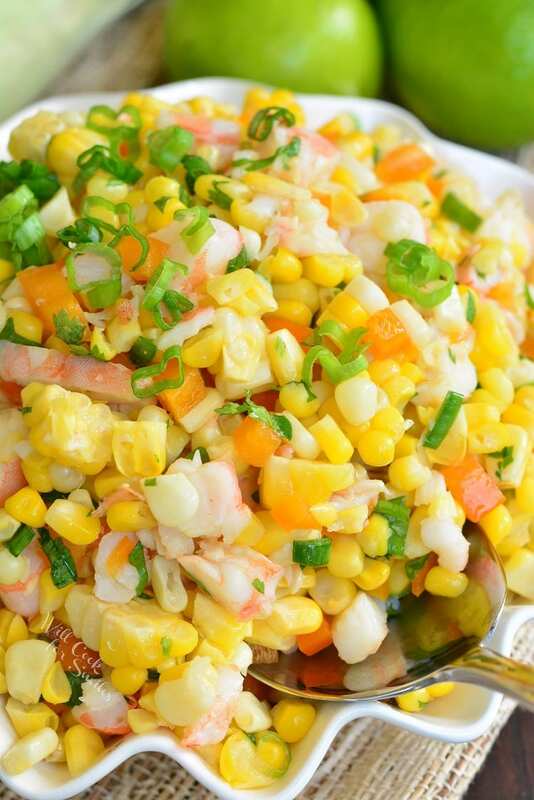 Wonderful cold corn salad that will compliment any summer cookout with its slightly sweet, citrus flavors. 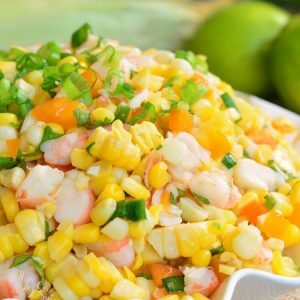 This corn salad is made with shrimp, sweet bell peppers, shallots, and fresh cilantro and lime flavors throughout. It can be simply cooked on stove top or the grill. I hope everyone is enjoying these warm summer months. I’m enjoying the summer but maybe not so much the warmth scolding heat that is outside. Over the last couple of weeks, it’s just been getting hotter, and hotter, and hotter. You know it’s summer in Florida when heat index is showing “feels like 102” at 10 am. Those are the days I feel like hibernating inside under the air vent. I dread my son asking me to make him a little pizza for dinner because that would mean turning on the oven. Oven is evil in the summer. Stove-top doesn’t omit nearly as much heat but oven, oven is mean. Next week is 4th of July and you know that means grilling. Grill seems to be even more evil than the oven in the middle of summer. I’m keeping my fingers crossed for an overcast. No clear skies, please! We just can’t have a 4th of July celebration without a cookout. It’s the law and I won’t allow it…I just wish we lived somewhere up north, where there is no 105 temperatures with a 90% humidity. So I try to stick to no-bake desserts, cold salads, and other things that can enjoy cold with the tasty grilled meats. One of my favorite cold salads is a corn salad. I love the touch of sweetness from corn in a savory salad. There is no need to add honey or anything sweet because corn and bell peppers bring their own natural, mild sweetness. I balance it with a citrus of limes and a little spice from chipotle chili powder. As I mentioned above, this corn salad can be made on stove top or on the grill. Personally, I prefer to make it on the stove because I like to infuse corn and shrimp with the cilantro lime flavors as they cook. 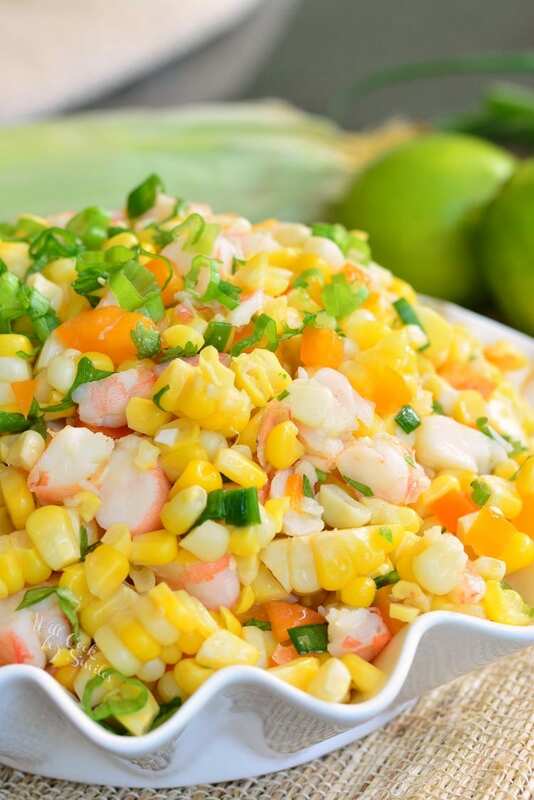 I flavor the water that shrimp and corn is cooked in and that ensures a deeper flavor throughout the dish. 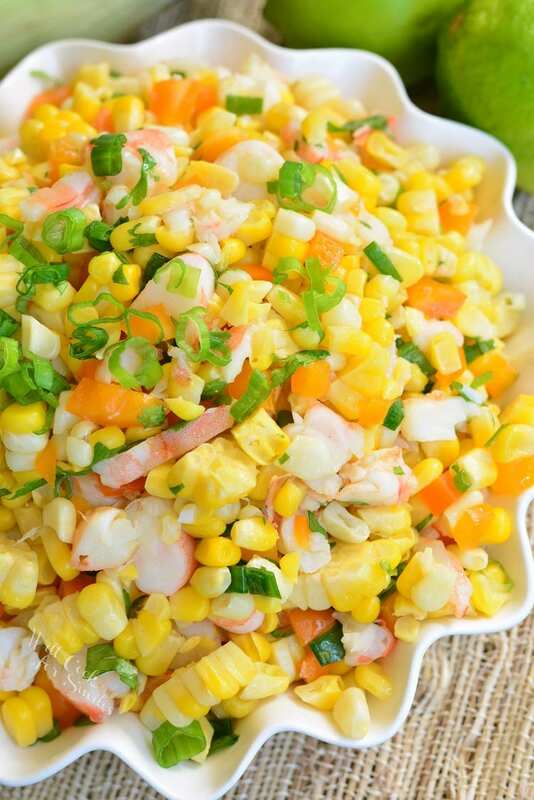 On the other hand, grilling corn and shrimp will infuse the salad with smokey grill flavors. So each method will produce a slightly different but delicious flavor profile in the salad. How do I make this corn salad on the grill? Making this salad on the grill is quite simple. Start with corn still in husks and make sure to shell and clean out your shrimp. 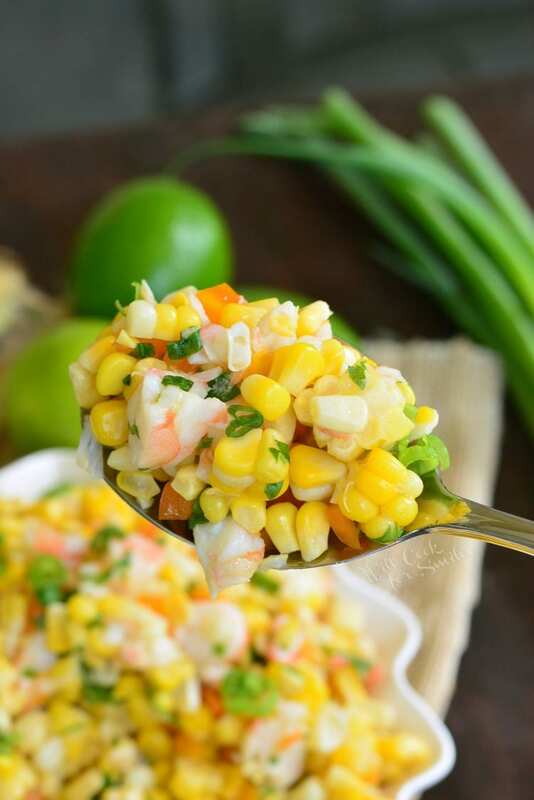 Mix the shrimp with some lime juice, cilantro, oil, and salt and let it marinade while you start cooking the corn. Corn will take much longer than shrimp. To grill corn: Prepare your charcoal until it’s ashed over and move it to one half of the grill so that you have a cooler grill side and a hotter grill side. Take corn off the grill and carefully, using tongues, take off the husk and the silk. Brush corn with a mixture of oil, lime juice, cilantro, and salt. Place corn back on the grill and close the grill. Cook, turning it every 3-4 minutes, until lightly charred on all sides. When the corn is almost done, place shrimp on the grill. Shrimp will only need 4-5 minutes, depending on size. Take shrimp off skewers and chop them into small pieces. Add chopped shrimp to the mixing bowl as well. Mix everything else according to the recipe below. 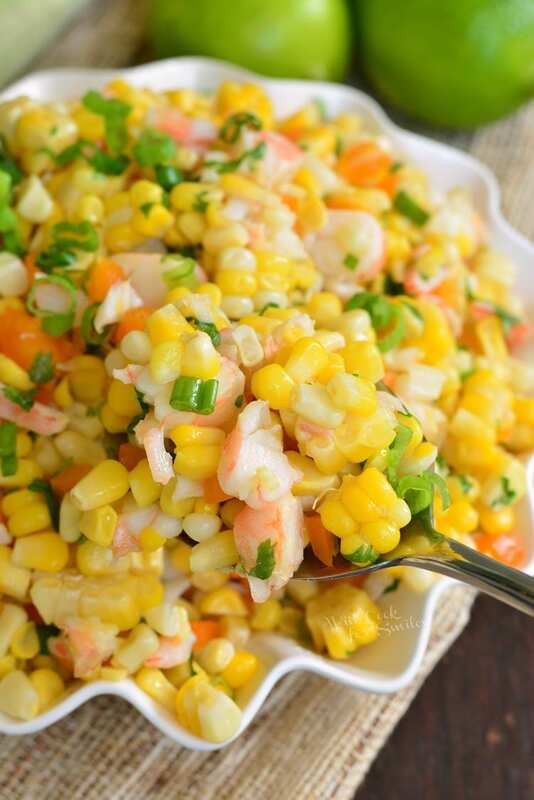 Delicious corn salad made with shrimp, sweet bell peppers, shallots and fresh cilantro lime flavors throughout. Once the water starts to simmer, add about a tablespoon of salt and 2 tablespoons of cilantro. Cut 3 limes in half and squeeze out the juice into the pot. Place the squeezed lime halves into the pot as well. Mix. Add corn to the simmering water and cook until corn is done. This will take 10-12 minutes. While corn is cooking, clean out the shrimp. Once corn is done, use tongues to take corn cobs out and set them on a cutting board to cool. Take cooked shrimp out of the pot and let them cool. Cut corn kernels off the cobs and add corn to the mixing bowl. Chop cooked shrimp and add it to the mixing bowl as well. Dice bell pepper and shallot and add them to the mixing bowl. Add green onion, lime zest, lime juice, olive oil, some salt, and chili powder to the mixing bowl and mix everything well. Transfer into a container with a lid and refrigerate. Keep refrigerated until ready to serve. I thought this salad was somewhat tasteless, yet it has an after taste…anything I can add to change this? You can add some more chipotle chili powder to add more spice and even some paprika to bring in smokiness. A little more salt might enhance the flavors. It is a cool, mild salad that goes well with BBQ meats to balance those flavors. If you’re just having it on it’s own, you can definitely bring up the spice level or even put it in a pita like a sandwich.